The craze of hoverboards is blooming and in the years to come, you will certainly need the eco-friendly means of personal transportation. These are pollution free and are also cost-effective means of transportation. With the Cool&Fun W8S electric scooters you can explore the beauty of life and nature and also travel long distances without thinking about refilling your battery again and again. These are very stable and come in designs that are simply stunning. Let us go through some of the most striking features of these smart electric scooters in detail. The frequent fire issues in the 2015s have created a fear in the mind of all hoverboard enthusiasts and it has, therefore, become very tough to decide the safest products. These scooters which we are talking about are completely safe and sound and have been approved by one of the premier units. The Underwriters Laboratory is the center for testing hoverboards on grounds of safety and quality. The Cool&Fun electric scooters are UL 2272 certified after passing through rigorous tests. This implies that these hoverboards are 100% safe and do not have any issues like over-heating, sparkling, short-circuiting or even fire accidents. Speed is what we fancy the most. If the hoverboard is smart, that’s good. But if it doesn’t give good speed, then you will probably dislike the product. The Cool&Fun hoverboards are fast and thrilling and give a maximum speed of 7 miles per hour. The fun begins here. You can explore the city and go about anywhere you feel like. This is actually the mileage we are talking about. The maximum distance covered by these hoverboards in one go at a full charge is near to 15-17 km. You no more need to worry at the roadside with chargeless electric scooters because they can sustain a long time in a single charge. These hoverboards are mainly famous for their exclusive tires. The 8.5-inch wheels provide a great off-road riding experience. Along with that, you will have ease in traveling over all kinds of uneven terrains like sand, snow or gravel. These are dual rugged, tubeless tires which are specially designed to meet the needs of the outdoor riders. The point to be noted here is, since these are 8.5-inch wheel electric scooters they are no doubts best for outdoor riding but becomes a little difficult to handle indoors. So, first decide on to where you wish to ride your self-balancing board and then decide. The ever attracting and worth having the feature of the hoverboards, the Bluetooth feature, makes it a great choice for the music lovers as well. The sound quality is good and this device can be easily connected to the mobile phones. The exclusive app feature is well and good for both android and ios systems. You can track your directions, speed and charge of the scooter with its help. This is something like mixing the software technology with the machine technology and making the most of it. The fun is immense and the rider experience becomes even better when you are riding with your favorite music on. As the name suggests, these hoverboards are cool and are awesome for having fun, be it with your friends or family. These are light and weigh just around 13.4 kg. The attractive LEDs make it one of the coolest hoverboards of all time. Like any other standard hoverboards, these take a very decent time to charge. In just over 2-3 hours you can fill in the charges inside them and the good thing is there won’t be problems like sparkling or short-circuiting due to overcharging as well. The batteries are designed with a great feature to stop the intake of charges once it is fully charged. Also, the 4.4Ah batteries make it super amazing and fun to ride without annoying you of its charging speed. They last long with an average play time of over 4-5 hours. Well, that’s a really long duration. Now comes the time that we introduce you to the budget. The price range may vary across different platforms but the average will be the same. These are not very expensive and you can easily get them in the price range $300-$350 from online sites or the regional markets. The good thing about them is the warranty that you get and also the service just in case anything bad happens. So we can say that the supreme quality hoverboards are among the best hoverboards you can get. This is because the features are great and it also includes quality Bluetooth availability. Being lightly weighted, these are portable and gives a smooth and stable ride for all the riders. 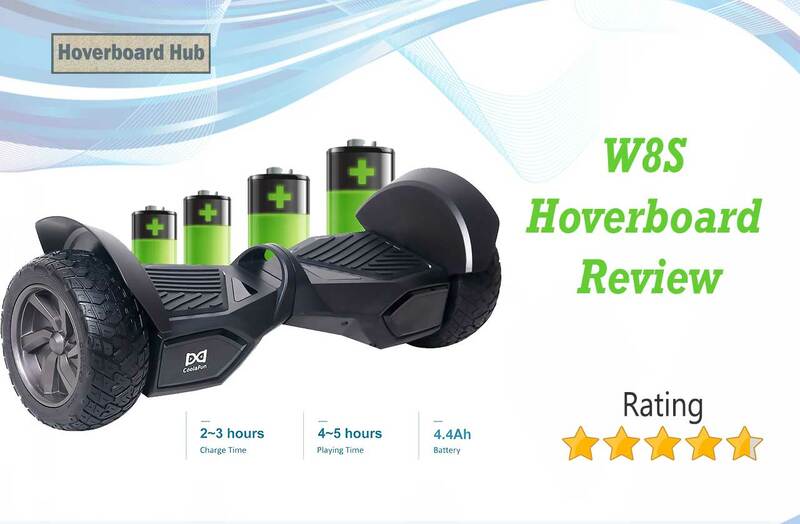 Whether you are a beginner or you have reached the stage of proficiency, this hoverboard will definitely make you go crazy once you ride. These are durable and also requires less time for charging. The maximum weight it supports is 220 pounds just like the standard hoverboards. They also ride quite well in difficult terrains and can sustain inclinations of more than 15 degrees. That means you can even try out your gymnastic skills and surprise your friends with your hidden talents. All these at an affordable price are simply cherry on the cake and you will never regret buying this piece.